Legit Reviews reports Gigabyte has released the GV-R777OC-1GD (rev. 2.0). Oddly enough, the pricing of this new Radeon HD 7770 remains the same but clockspeeds are lower then the first model! The site notes the company did the same thing with the GTX 560 Super Overclock (GV-N560SO-1GI) revision 2 last year. 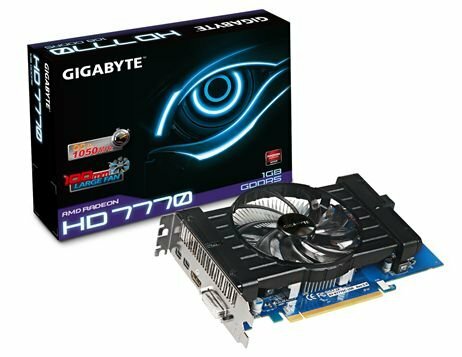 Gigabyte has launched a second revision of its HD 7770 graphics card and given it model number GV-R777OC-1GD (rev. 2.0). However, the only difference appears to be with the clock speeds, which have gone the wrong way - down. The two cards look identical and have identical boxes, with the only thing giving the difference away being the description on the boxes and the sticker on the cards. Revision 1 had a GPU clock of 1100MHz and memory of 5000MHz (effective). However, revision 2 has reduced these to 1050/4000MHz for some reason that isn't clear. Also, the price remains the same at around $140, so if you can find the older version, then get that. Full product specs are available at the link below.